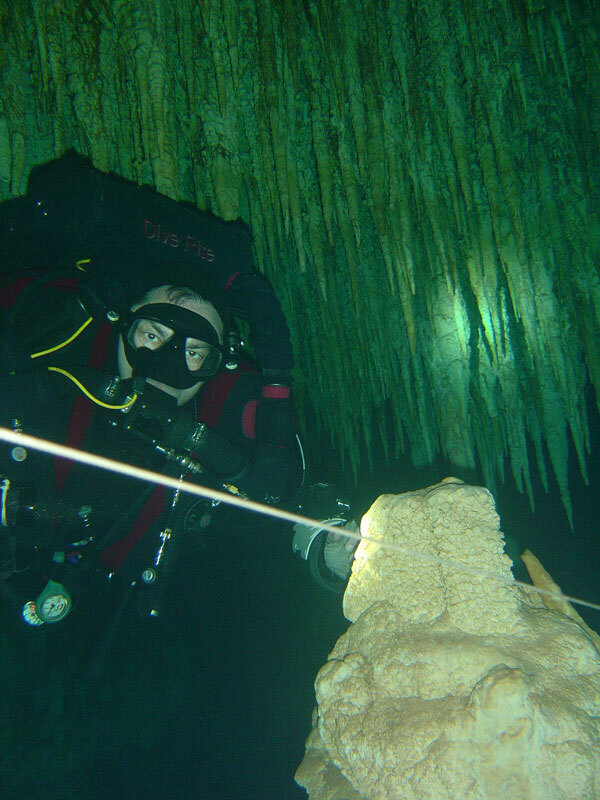 The advantages of a closed circuit rebreather in a shallow cave. I have to admit that I recently neglected rebreather diving and instead spend most of my time off sidemounting. I pretty much used my rebreather for deep diving only. 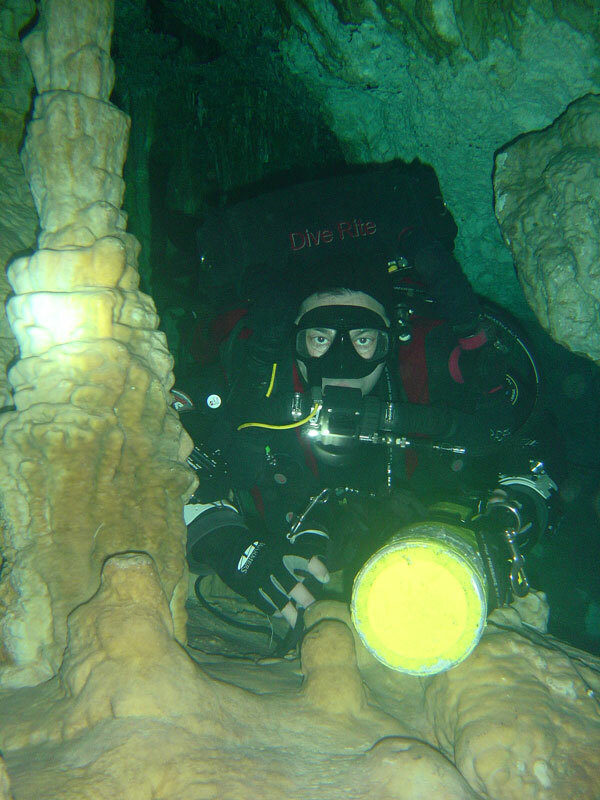 But recently that changed, I finished crossover training on the Poseidon Cis Luna Mk6 and right after that was with Howard, aka Scubadadmiami for a week of CCR Cave diving. And I am hooked on CCRs again. The Mk6 exceeded my expectations but this is not what this article is about. What I want to share here is my recent experience diving Ponderosa, Taj Maha, Nohoch Nah Chich, Grand Cenote, Carwash and Naharon. Generally all the dive sites have an average depth of about 30ft and Nohoch even being shallower with Naharon being the exception at 60ft. In many posts on CCR forums, the Mexican caves are described as CCR “unfriendly” and honestly I do not understand why? 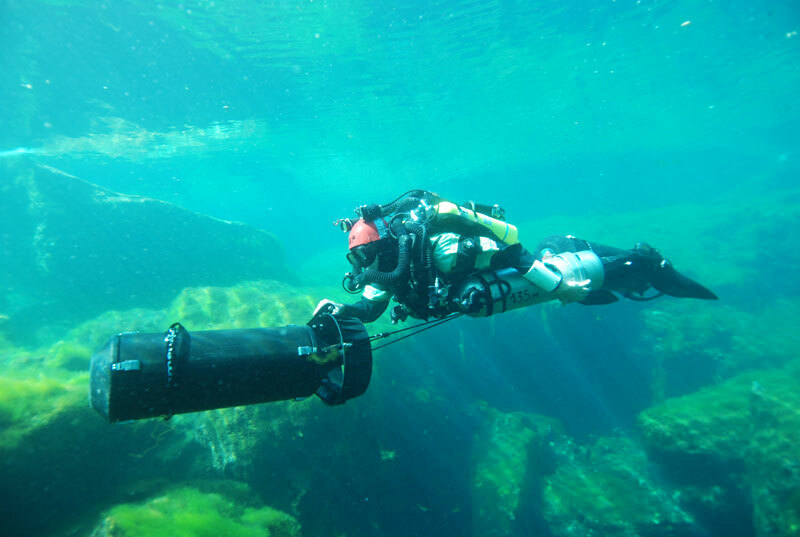 Our recent experience illustrated that CCRs can be used effectively in these caves and enabled us to get to know whole sections of systems in only one dive. Normally when I guide people open circuit I choose a cenote and then guide two dives to the most famous or pretty parts of the system. The dives are usually turned either on time or gas which results in returning to open water. The option to recalculate thirds does exist, however, my opinion is that it should be reserved for experienced divers with experience in the particular system. When divers elect to recalculate thirds, eventually the gas reserve becomes to small to be safe. The advantage of the CCR is that you have a bail out radius which enables you to spend as much time as the scrubber will allow, normally about 3 hours which is a huge opportunity here in the Riviera Maya. Once you come of the frequent traveled passages you will often encounter quiet significant amount of percolation that can seriously affect the visibility. Thinking about the lost line or lost diver scenario, imagine how your chance of survival or the chance of finding your dive partner will increase with an hours long supply of breathing gas. How many accident reports have we seen that speak about people drowning only minutes away from an exit, what would have happened if they would have been on a rebreather. Taking pictures on the way, on a CCR you penetration distance is not going to change because you stop at a place to take some pictures or simply take a brake. Think about a reverse block way back in a cave, how much more relaxed are you going to be, knowing you can stay there fro hours. No time or gas pressure to go to a certain part in the cave and therefore reduced chance of pushing limits due to being goal oriented. Buoyancy is definitely more difficult. It is the perfect tool to bring people that where before limited by their air consumption far into the overhead environment and by that outside of their comfort and experience zone. With most units together with the bail out your overall size in the water column is bigger and therefore you need more effort to travel. Many ups and downs consume Oxygen and Diluent volume. Getting overconfident due to the feeling of having unlimited gas supply. Proper bail out gas and volume is never an issue until it becomes an issue. To have a real advantage with the CCR we have to change the way we dive in the cave. Instead of using it to go for that record braking long distance penetration why not stay closer to the entrance but get to know all the lines that are in that area. For example, at Naharon we dove up the main line and did the Jump towards the double domes. We swam up that line until we reached 40min, or bail out distance. On the way we stopped several times to take pictures and simply stopped the timer while we did not go further in the cave. On the way we marked the double set of line arrows that mark the jump towards south western sac be. On our return we arrived back at the arrows and new that from this point on we had 30min for further penetration so now we did the jump and enjoyed the really unreal beautiful sac be section. On the way there we pass yet another set of double arrows marking the jump that lead down towards Cenote Mayan Blue and again marked it. We continued in the sac be tunnel until we had reached 30min from the jump and turned our dive. On the way back we stopped again a couple of times to take pictures. We didn’t even have to take care about the time since we were well inside our bail out range. As we arrived back at the Arrows we decided to make yet another jump and check out the line that leads towards Mayan Blue. After some time we turned from there and now did the entire return trip back to Cenote Naharon. As you can see, we did in one dive what, in conventional OC cave diving style would need three dives. We had an average depth of close to 60ft with a 180min runtime, me carrying an 80cuf and Howard 2 40cuf bail out tanks. Another example would be Carwash where we could use Lukes Hope to restart the 40min bail out range and therefore had plenty of time to visit the room of tears and all the different Ts in the back. On the way out we did the jump that leads to the back of the room and stayed there for like 30min just doing pictures and enjoying the decorations. In Grand cenote we went down to the Cuza Nah Loop and could restart the 40 min each time we past a cenote which was awesome since this gave us the possibility to do the jump at the mid way of the loop and take our time while swimming down that line again taking pictures and having a great time. On the way back we continued the loop on the other way since we were still easy inside our bail out range. And the same was done in all the other places. All in all I really enjoyed this week especially the possibility to visit lines I have not been too in a long time. I really love to do complex navigation, see different lines and go back and forth and all around. Another bonus, so to speak, was to get more experience on the Kiss Classic which I really start to like more and more for its simplicity, the 20min prep in the morning and the 5min tear down in the evening, the free chest, constant O2 flow which facilitates buoyancy and the general possibility to keep the same configuration than with a set of doubles. For Howard it was great too because he really got to know quiet a bit of each system we dove at, although he only did ONE dive there. Considering all of the above, I would call the caves here perfectly suited for CCR diving if you bring the right set of skills, a good attitude and some creativity to the table. Of course there are always people that say OC backmount is the only way to go and others believe that OC sidemount is the best, then there are some that believe in multiple stages or scooters or I don’t know what else; Me, I think it all has its use and its just what you do with it that makes it valuable. Try to get the most advantages out of whatever equipment you use and try to work with the right tool for the job! Keep the loop closed but your mind open!!! Dive Number 400! 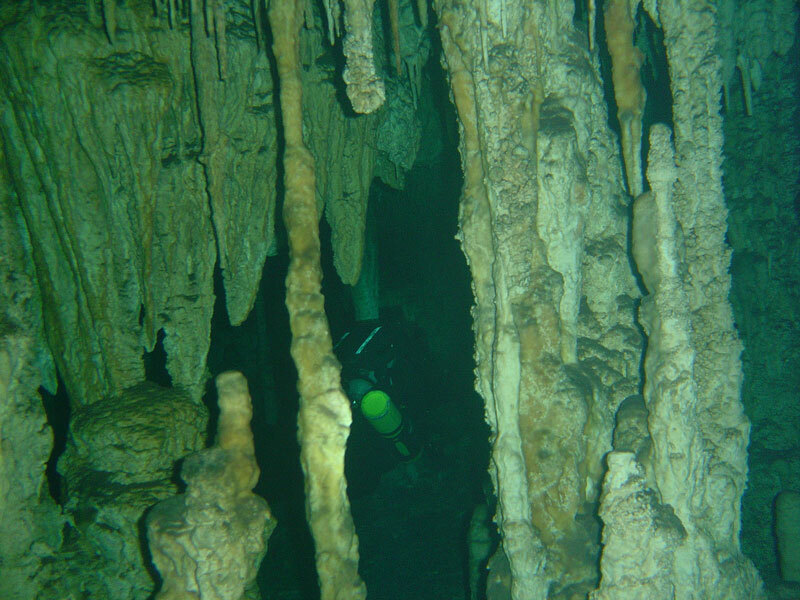 Rebreather Cave Dive at Grand Cenote with John. Today was my 400th logged dive. John took the early ferry over from Cozumel. I picked him up and we left for the fill station. At the fill station I asked John to review all of his gear and let me know if he had everything he needed. I told him I didn’t want to get to Tulum and find out we were missing something. He assured me everything was there and we were ready to go. 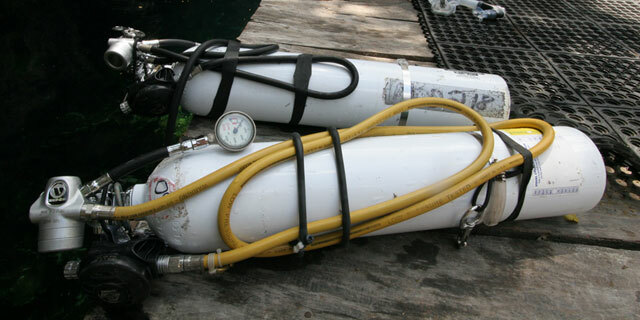 As luck would have it, once we arrived at Grand Cenote and started to assemble our rigs, I realized I forgot John’s bailout regulator. I was supposed to loan him one of mine, and since it wasn’t part of my kit, I totally spaced on it. I jumped in the car and headed over to Xibalba Dive Center in town and Robbie kindly assembled a regulator and rented it to us. I was back at the Cenote in 10 minutes. Problem solved and we were back in business. John and I decided to do one long dive. The plan was to head down to Lithium Sunrise and then return to the first arrow and make the shortcut jump down to Cenote Ho Tul and Cuzan Ha. The dive went very well, except that when we got to the second jump on the way to Lithium, there was another team with gear. I started to install our gear and realized I was in the wrong position. So I picked it all back up and re-laid the gear in. I really like nicely placed lines. Messy lines will make for a messy exit and they look hideous. This debacle wasted about 6-7 minutes. I hate to be robbed of the time, but I could just hear Patrick correcting me about my line placement. Total run time for the dive was 2:32 minutes. John seemed really happy with the dive. He pointed out all the hand and body prints and I told him it is the result of being on the top ten list of places to dive. You really have to get off the beaten path and away from the typically guided locations to find pristine cave. Diving the Megalodon has been great! In the last 21 days I put in 15 hours on the unit over 10 dives. I finally felt comfortable again, the last couple of weeks have been full of setup changes and discomfort. The only thing that remains is to move the clips up the 40cuft cylinders so they pull a little tighter into the body. I hate the feeling of bottles swinging forward and aft with each stroke. Just feels like it is robbing energy. It was a pleasure to dive with John and I look forward to diving with him again. 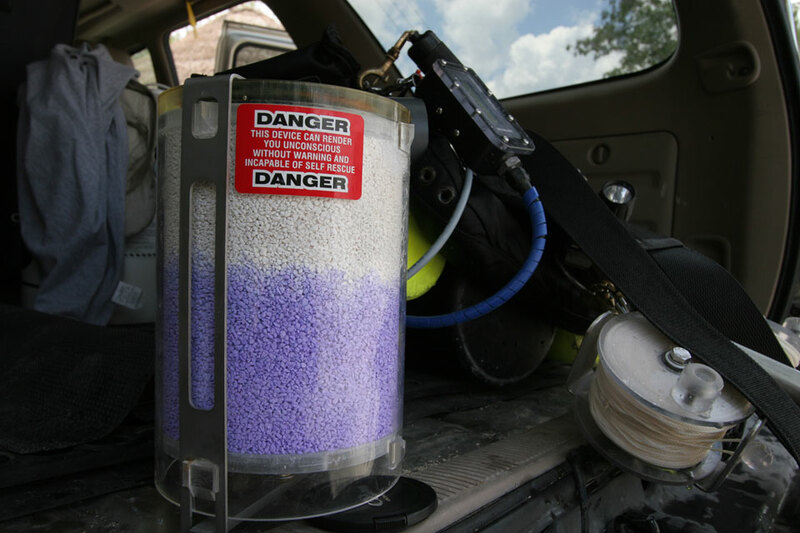 Just take a look at the picture of the scrubber. That is the evidence of two days of great diving. I love the satisfaction of pulling a hot scrubber out and checking to see how much I have burned through. On Friday morning our friend Paul flew into town to do some cave diving! It was his first trip after finishing full cave with Protech in November. We planned to do 2 dives a day Friday through Monday. However, the airlines had other plans and his flight was late on Friday, so we were limited to a warm up dive on Friday. First thing we did was to go over to Chac Mool and do a quick gear review. Paul had just gotten a beautiful new Halcyon harness and donut wing. We revised his hose routing a little and tweaked some other minor things. Those minor improvements really made a difference. The crew was Allie, Paul and myself. Paul and Allie were in backmount and I was in side mount. We got in the water, did our S drill and dropped down. The dive was called immediately on account of Allie not being able to equalize. Unfortunately, she had been suffering a minor cold. There were tears all around and then Paul and I elected to continue the dive. We did a quick S drill and started the dive. Paul did a nice job of running the reel. We made the 30 minute swim down to The Monster. The Monster is the world’s largest underwater stalagetite. It measures 45feet tall and it hangs into a pit that is 90feet deep. It is really stunning the first time you see it. I always want to swim over to it and put my arms around it. We chose to dive Chac Mool becuase it is a realatively easy dive and there is only one T to contend with and that leads to a air doom that is breathable. Most of this dive is pretty ho hum, as you get to The Monster the rooms become more decorated and enjoyable. The return trip was uneventful. When we got back to Playa we decided to go to one of our favorite restaurants, La Cueva Del Chango. Saturday brought fabulous weather and we headed down to Tulum for some diving. Allie wanted to give her head another day to clear, so Paul and I were on our own. We decided to go to Grand Cenote and do two dives. The first dive was down to the Cuzan Ha Loop. We elected to make this dive a little more complex, so we took the short cut jumping to the left on the first arrow. At the end of the line we jumped back onto the main line and turned left. We gapped at Cenote Ho Tul. The dive was going fantastic. We were making good time and I could tell Paul was in complete sensory overload. When we got to to the jump for the circuit a little miscommunication/confusion occurred. I went to set the spool to close the loop and Paul followed me. When I realized he was behind me, I sent him back and then finished up. We I returned to the main line, we continued the dive. We made it about 3/4 of the way around the circuit and had to turn on thirds. As we exited we cleaned up our gear and took our time. This is a beautiful dive and it is fun. The restriction after Cenote Ho Tul is good fun and I particularly enjoy it. The second dive was towards Lithium Sunset. Last time I tried to find the jump off the mainline, I just couldn’t figure out where it was. I guess I wasn’t persistent enough. The picture I had in my mind’s eye was short jump, the reality was it is about 50 feet or so. Maybe less if you make it a straight shot. So we made the jump, went to the second arrow and made the short jump to the left. This is another beautiful dive although it is a little less challenging. If there is a no brainer, this is one of them. Just set the cruise control and enjoy the scenery. Some dives are just easier/less engaging then others. Paul was over joyed at the end of the dive. I was super relaxed and really enjoyed the dive. Grand Cenote is really a wonderful place to dive. The cave is bright white almost blue-ish and is highly decorated. Sunday Allie decided to join us. 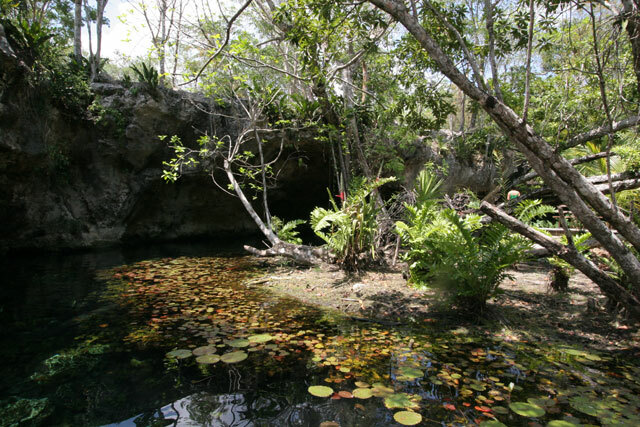 We planned to go down past Tulum to Cenote Cristal aka Naharon. 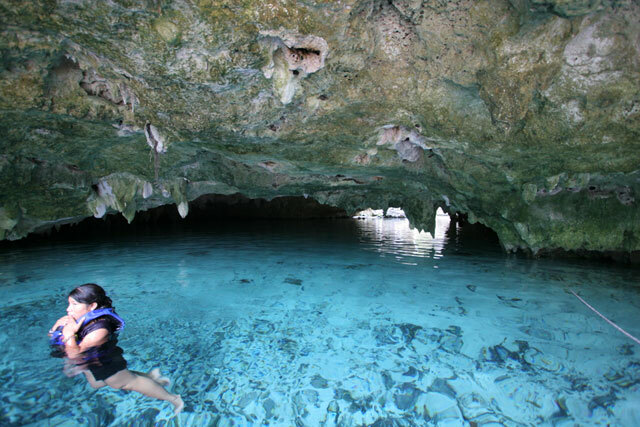 I wanted to give Paul the experience of the caves north of Tulum, in Tulum and south of Tulum. My experience is that they offer very distinct dives. And let me tell you, Naharon is no slouch! Naharon is feed by swampy lands to the north and west. Therefore the water in the system is tanic and stains everything. Naharon is about the darkest place I have ever dived and Allie and I find it to be a very psychologically challenging. It literally eats HID light. The darkness makes it very tight and unforgiving. This challenge makes the dive some much more rewarding! Once your field of view starts to open up, you discover the the black silk floors and the black stained formations are amazing. It is really like diving into the belly of a beast. On the main line there is a portal in the rock that looks like the jaws of a shark. As I pass through the formation, I imagine being swallowed by the beast. I guess the Halocline room is the belly. Naharon is a little deeper then most of the other caves we dive. We plan for a depth of about 70feet and to stay out of deco we use 32% EAN. The plan was to head up to the Halocline Room; which is about a 25 minute swim up the main line. The most striking feature of the Halocline Room is the demarcation on the walls between the fresh water and salter water. The wall below the saltwater is perfectly white. The wall above is tanic stained black. My understanding is that the saltwater eats the black stain. It is really stunning and a worthwhile dive. I really want to get down to Naharon with my CCR or a couple of stages. I can only imagine what treasures hide in the inky blackness. Dive over, it was time for food! We headed into Tulum for some Chicken! I love the chicken in Tulum. Our favorite place to eat is Pollo Bronco. It is an orange building on a corner on the north bound side of the road. Chicken can be had in the following sizes: quarter, half and whole. There are not really any other options. I think you can get pasta instead of rice. But, I never do. Lunch over, it was time for diving. We drove over to Car Wash for a little dive. Car Wash is a cenote where the taxi drivers used to wash their cars. The land owner has really made some improvements to this site since that time. There are rest rooms, changing rooms and tables to setup on. They have built a reception area at the Luke’s Hope cenote. It is really nice. 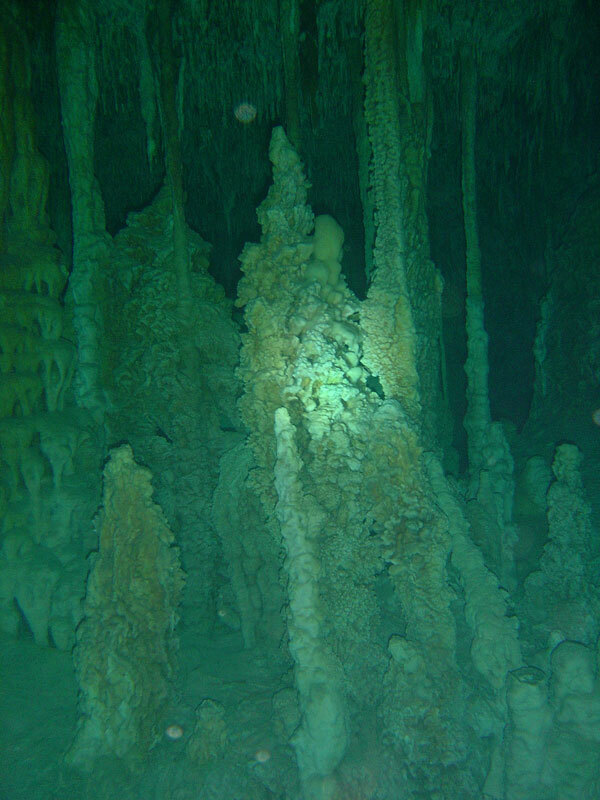 This time of year there is a cloudy layer for the first 10 feet in the cenote then visibility opens up. It is really awesome to drop down through the cloud into clear water and to watch a friend do the same. The visibility reminds me of wreck diving in NJ. This time it was Paul’s job to run the primary. We setup our primary tie in on a tree a couple of feet from another team’s, then we proceeded in. What we found was an unbelievable spider web of line. The team ahead of us had literally criss crossed the cave at different depths at least three times. Paul was confused and I was livid! Message to all you Muppets out there, “CAVE DOESN’T BELONG TO YOU!” There are other teams in the world, have some common decency. We spent an unreasonable amount of time negotiating the other team’s line. In the end we had two choices: call the dive or install our gear woven through theirs. We choose to install our gear. I helped Paul to take the most respectful path possible. Then we hit another snag, Paul’s primary reel was too short. I loaned him a spare Spool and we gapped to the main line. The lesson here is; confirm how much line you have on your primary reel. Don’t take the manufactures word for it. Unfortunately, the cavern debacle cut our penetration short. I think we made it 15 minutes past Luke’s Hope and Paul turned us on thirds. When we got back to open water, we recalculated thirds and went for a little exploratory dive down stream. Again we ran into the other team. Again they had taken the entire cave to themselves with their handy reel work. What a headache. Please learn to use your reel! Monday was going to be a short day for Paul and I. Since he hadn’t been to Minotauro, we went over and did the circuit in two dives. I blundered in my briefing, but nothing severe enough to call the dive. I actually realized it as soon as we submerged on the first dive. We setup the circiut and returned. The second dive we completed the circuit. The only thing notable was that I did the in about 1000PSI. I guess all this working out and concentrating on finning technique is paying off. Paul’s trip was fantastic and we had a great time. Hopefully he will come back soon and we can do some more diving. There are just too many beautiful places to see!